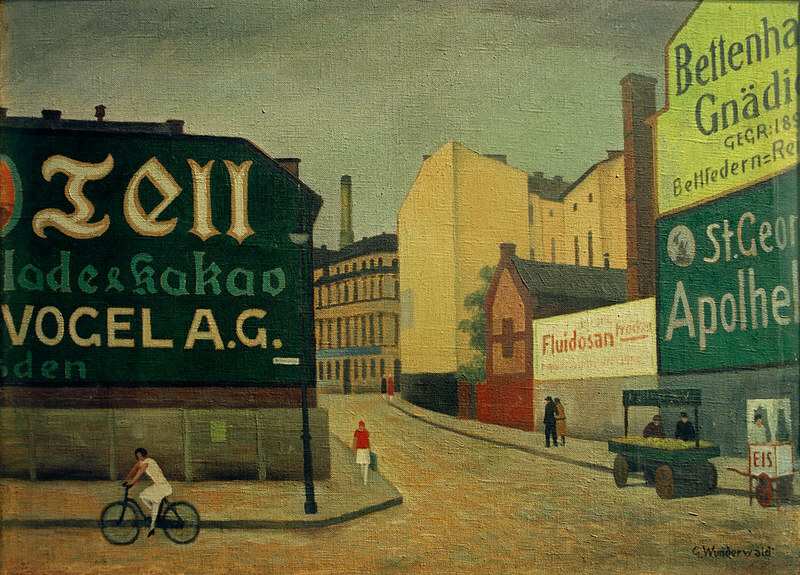 The Berlin of the 1920s is often associated with a certain excess and decadence, but it was a quite different side of the city — the “sobriety and desolation” of its industrial and working-class districts — which came to obsess the painter Gustav Wunderwald. Mark Hobbs explores. Gustav Wunderwald, Unterführung in Spandau, 1927 — Source. Berlin in June 1945 was not at all a pleasant place to be. As the dust settled on what was left of the city, blown to smithereens and now occupied by Russian and Allied forces, the landscape painter Gustav Wunderwald died from water poisoning in a hospital in the western suburb of Charlottenburg. He was sixty-three years old. In the seventy years or so that have passed since his death, the city that Wunderwald painted over and again during the years of the Weimar Republic has been divided, rebuilt, reunified, and revived. 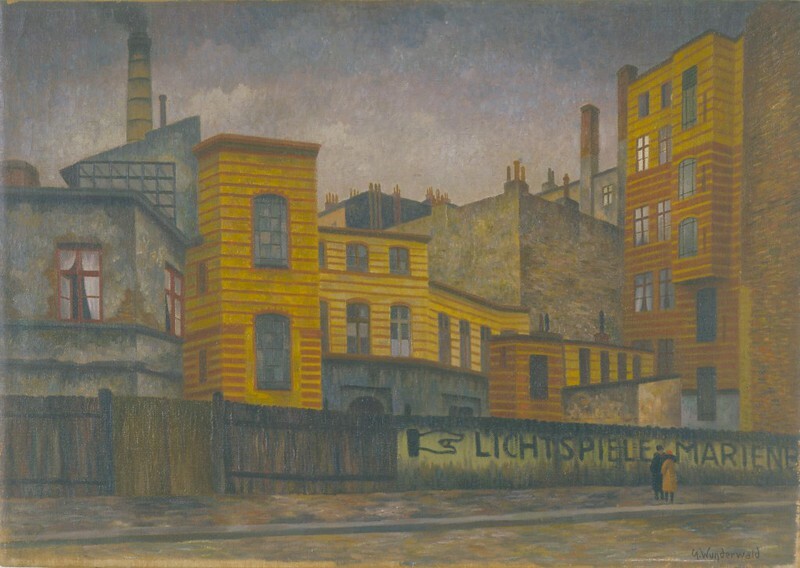 And yet, despite the waves of history that have beat relentlessly, remorselessly against Berlin, were he alive today, Wunderwald would still recognise many aspects of the city that he painted during the late twenties. And now, with the lapsing of copyright on his paintings in many parts of the world, digital copies of these paintings are becoming more widely available, making it easier to view his work, and to better appreciate an artist who deserves wider recognition. Gustav Wunderwald, Selbstbildnis, 1914 — Source. Born in Kalk, an industrial suburb on the outskirts of Cologne, Wunderwald experienced first-hand the modern, industrialised city from a young age. Showing early signs of a proficiency in painting, he undertook a two-year apprenticeship under the guidance of the painter Wilhelm Kuhn. Wunderwald quickly found his niche in theatrical and stage set design, taking a job as a scenery painter in Gotha in 1899. For the next thirteen years, his skills led him through a succession of jobs in a variety of cities. After a year in Gotha, he spent four years in Berlin (1900–1904) working at the studio of Georg Hartig and Company, where he specialised in theatrical set painting. From Berlin, Wunderwald moved to Stockholm, and then onwards to Düsseldorf, Innsbruck, and Freiberg over the course of the next eight years, before moving back to Berlin in 1912 to work as a stage designer at the German Opera House. 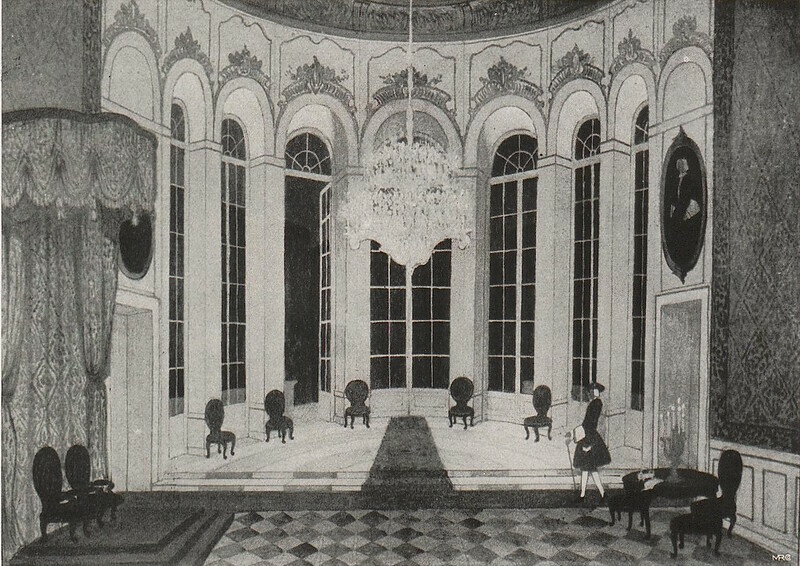 Gustav Wunderwald, Stage scenery for Mozart’s Marriage of Figaro, in Deutsche Kunst und Decoration. Vol. 39, 1916/1917, p.284 — Source: Universität Heidelberg (CC BY-SA). In 1915, Wunderwald was conscripted into the German army. Training in Königsberg was followed by despatch to Macedonia, as part of a replacement battalion for the German Army’s 43rd Infantry. Wunderwald was fortunate in that the Macedonian Front was a stable one, which saw little of the bloodshed that characterised both the Western and Eastern Fronts. Wunderwald even had time to paint pictures of the Macedonian landscape and towns that he saw, giving him the opportunity to hone his distinctive palette of dark colours. Gustav Wunderwald, Straße in Üskyp (Mazedonien). c.1917 — Source. In the wake of Germany’s defeat in 1918 he returned to Berlin, where he sought to establish himself as an independent artist, using his Charlottenburg apartment as a studio. Some eight years later, in 1926, Wunderwald’s persistence paid off when he came to the attention of Berlin gallery owner Karl Nierendorf and the prominent art critic Paul Westheim. 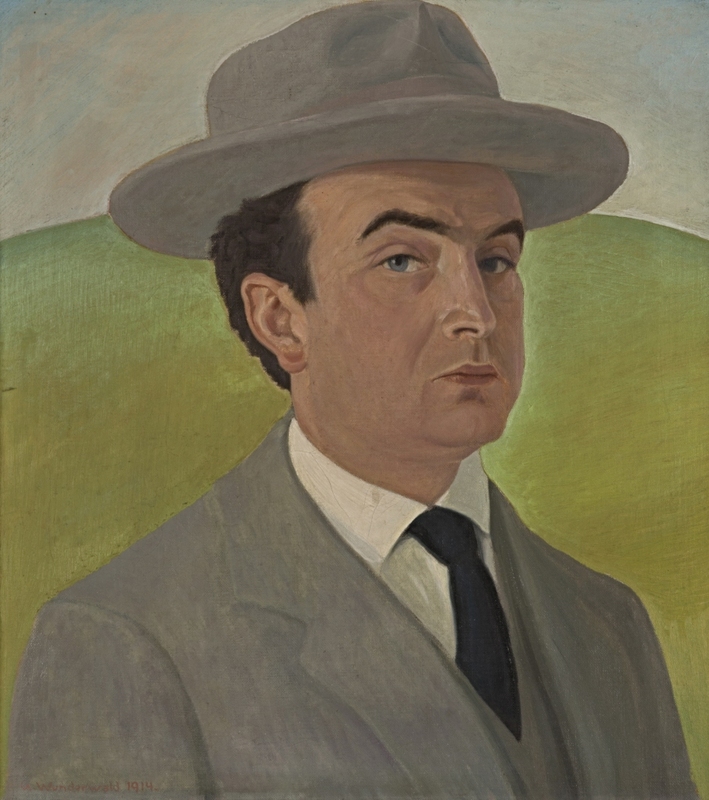 Later that year, seven of Wunderwald’s paintings appeared in an exhibition entitled Das Gesicht von Berlin (The Face of Berlin) at Nierendorf’s gallery. To coincide with the exhibition, Westheim wrote a lead article on Wunderwald in his own art journal Das Kunstblatt, reproducing several works by the artist.1 For a few brief years, Wunderwald’s urban landscapes attracted attention in high places. Among those who brought his works were Gustav Böß, then mayor of Berlin, and the screenwriter Hans Kyser, writer of the script for F. W. Murnau’s 1926 filmic adaptation of Faust. 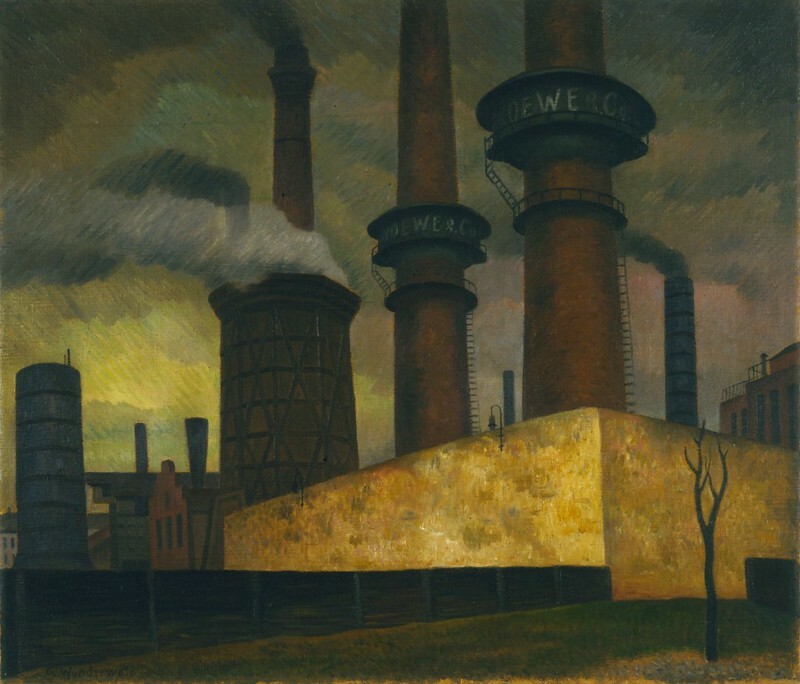 Wunderwald continued to paint and exhibit until 1934, but without doubt his most prolific phase, and the period in which he produced his very best works, was between 1926 and 1929, when he repeatedly painted scenes from Berlin’s industrial areas. He worked as a film colourist for the German film conglomerate Ufa from 1934 until his death in 1945. 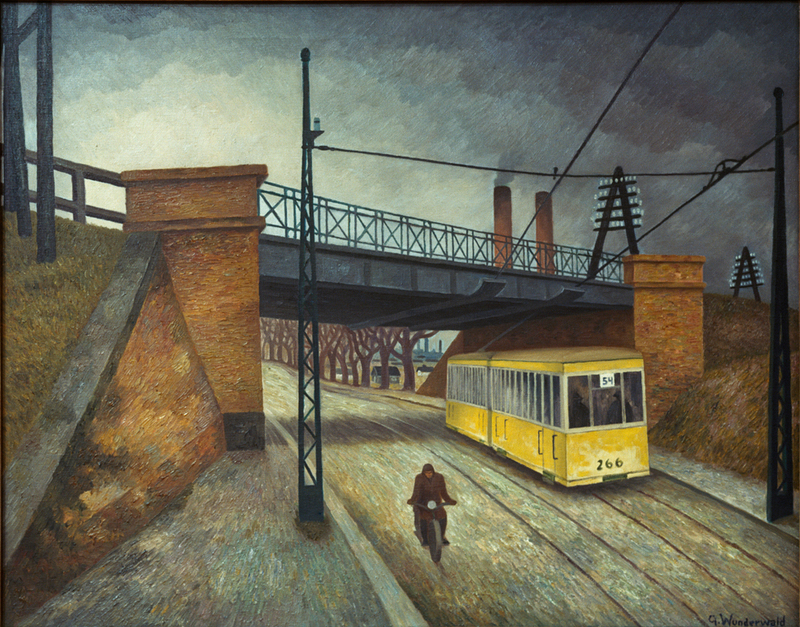 Gustav Wunderwald, Brücke über die Ackerstraße, 1927 — Source. Wunderwald’s paintings of Berlin’s working-class neighbourhoods have an enigmatic quality about them. They employ a sooty palette of warm browns and greys, and have a stillness and architectural solidity to them that can perhaps be accounted for by the artist’s prior experience as a painter of theatrical scenery. One could well image scenes such as Fabrik von Loewe & Co. or Brücke über die Ackerstraße as backdrops to theatrical adaptations of Weimar-era novels like Alfred Döblin’s Berliner Alexanderplatz, Hans Fallada’s Little Man What Now?, or Christopher Isherwood’s Goodbye to Berlin. Gustav Wunderwald, Fabrik von Loewe & Co. (Moabit), 1926 — Source. Amidst the tenement blocks, factories, smokestacks, and advertising hoardings, Wunderwald found no shortage of subjects to paint. In a letter to a friend, written in the winter of 1926, he wrote: “Sometimes I stagger back as if drunk from my wandering through Berlin; there are so many impressions that I have no idea which way to go.”3 Wunderwald, describing his search for inspiring scenes to paint on the streets of the city, was not the first and by no means the last individual to find themselves overwhelmed by the sights and sounds of Berlin. His description of feeling drunk through sensory overload brings to mind fellow Berliner and sociologist Georg Simmel’s description of the “intensification of nervous stimulation” that the modern city-dweller encountered on the streets of the metropolis.4 Most urban inhabitants, argued Simmel, adopted a blasé attitude in order to protect themselves from the excess of sights, sounds, and movement encountered in the urban public sphere. By contrast, some individuals — like Wunderwald — consciously chose to immerse themselves in the tumult of the big city, wandering around its streets in a state of rapture, just as Baudelaire had done in Paris half a century earlier. Gustav Wunderwald, An der Landsberger Straße, 1926 — Source. Berlin was — and still is — a city of “moments and discontinuities”. In 1910, the architectural critic Karl Scheffler wrote of Berlin as “always becoming, never being”.6 Scheffler’s phrase, oft-quoted thanks to its enduring relevance, referred to the city’s rapid growth throughout the latter part of the nineteenth and early twentieth century. When the city became the capital of a unified Germany in 1871, it was already well on the way to becoming one of the new nation’s most important industrial centres, thanks to its burgeoning railway construction industry. From 1890 onwards the city’s rapid growth was further bolstered by a new electrical engineering industry, spearheaded by Emil Rathenau and his Allgemeine Elektricitäts Gesellschaft (AEG). Between 1871 and 1910 Berlin’s population jumped from 824,000 to over two million inhabitants.7 A large proportion of the new inhabitants were immigrants from the surrounding provinces, who moved to Berlin in search of work in industrial districts such as Wedding, Moabit, and Prenzlauer Berg, districts characterised by long streets of densely populated tenements and factories. The city that Scheffler wrote of was that very same encountered by Wunderwald during his first stay in Berlin between 1900 and 1904, and this sense of constant flux is key to developing a better understanding of Wunderwald’s portraits of the city. Thanks to his frequent tendency to specify the places he painted in the titles he gave to his works, and with the aid of the city’s digitised address books, it is possible to look at the paintings he produced of the city in the twenties and figure out what the same scenes looked like years earlier, when he first saw them (if he did at all). What’s clear from such an exercise is that in many cases significant changes had taken place in the scenes that he painted. 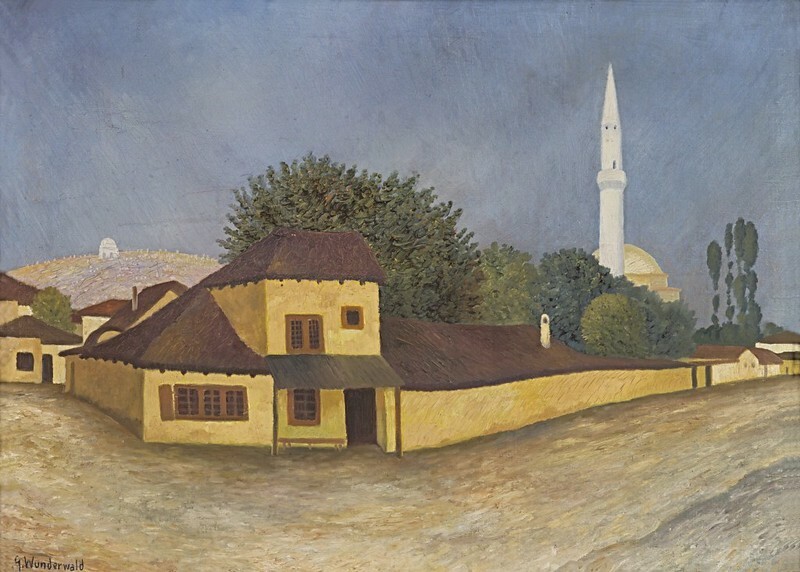 Gustav Wunderwald, An der Travemünder Straße, 1927 — Source. This is best illustrated in a 1927 painting by Wunderwald of Travemünder Straße, in the north Berlin neighbourhood of Gesundbrunnen. Travemünder Straße was a relatively new street, having been constructed in 1906; that is, after Wunderwald had departed Berlin for the first time. In order to lay out the new street, Berlin’s municipal authorities partially demolished one of the city’s most ostentatiously decorated tenements, built in the 1890s and known as the Luisenhaus, the rear of which can be seen at the right of the painting. In spite of the wholesale destruction of the city during the Second World War, it is still possible to visit some of the streets that Wunderwald painted in the 1920s, and recognise the scenes he depicted. 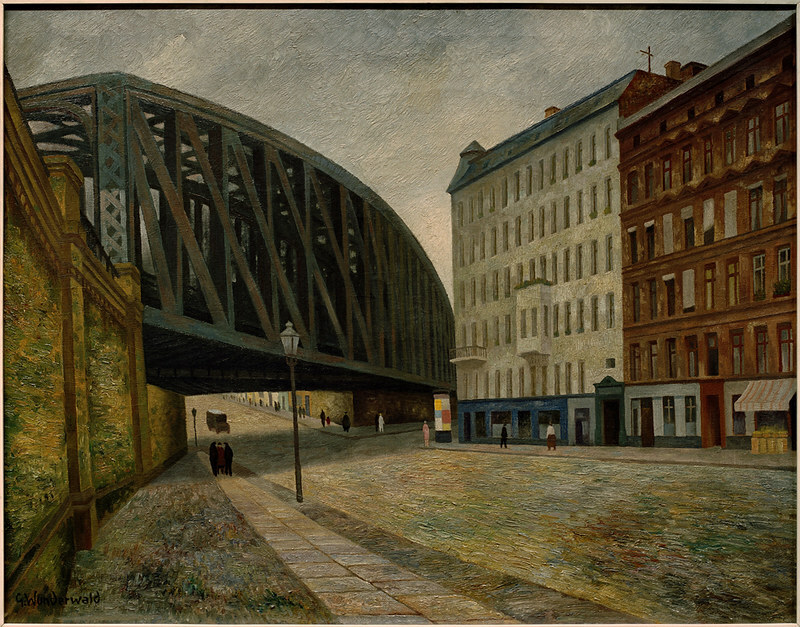 Any tour would have to include a trip to the northern district of Wedding, to see the monumental iron railway bridge that weighs heavily over Ackerstraße, the busy street intersection of Müllerstraße and Seestraße, and factory buildings and tenements on Lindowerstraße. Given how much has survived and how much has changed — moments and discontinuities — I like to think that Wunderwald would be happy to wander about present-day Berlin, a city that remains in a perpetual state of flux, just as it was in his own day. 1. Paul Westheim “Gustav Wunderwald” Das Kunstblatt 11, no.1 (1927). 2. For example, Serguisz Michalski, Neue Sachlichkeit. Malerei, Graphik und Photographie in Deutschland 1919-1933 (Taschen, 1998). 3. Hildegard Reinhardt, ed., Wilhelm Schmidtbonn und Gustav Wunderwald : Dokumente einer Freundschaft 1908–29 (Bonn: Ludwig Röhrscheid Verlag, 1980), 86. 7. Emmy Reich, Der Wohnungsmarkt in Berlin von 1840 – 1910, vol. 164, Staats- und sozialwissenschaftliche Forschungen (Munich: Duncker & Humblot, 1912), 124-25. This lavishly illustrated book examines Berlin in depth during a period of explosive growth between the two world wars (though sadly omits mention of Wunderwald).